The growth of men’s fashion in Pakistan has been slow and it hasn’t grown at the same pace as womenswear has for the last five to seven years. While the limited market and narrow consumer base could be the reasons for this shaky progress, inconsistent showcases by menswear designers and designers succumbing to the lure of commercial moolah are equally to be blamed for. While the likes of Ismail Farid and Jazib Qamar vanished after showing a collection or two to some very favourable response, there are others like HSY and Deepak Perwani for ­whom womenswear is way too commercially profitable to take menswear seriously. Yet, there are menswear designers who have stuck to their guns. They have established a strong aesthetic and a name for themselves. Republic by Omar Farooq and Arsalan Iqbal are two such names that come to mind. Although, Arsalan Iqbal has still a long way to go before establishing himself as coveted menswear brand, he has shown glimpses of promise in his collections and he takes retail quite seriously, which is always refreshing. Traditionally, at fashion weeks, menswear has always played second fiddle to the womenswear. But the scenario has been changing lately; men are more fashion savvy than ever and designer menswear has been making quite some inroads. An HSY snakeskin-print jumpsuit turns heads at fashion week and Republic by Omar Farooq gets the spotlight when Fawad Khan wears his brand to the red carpet of an awards show. The right kind of menswear has been making news. 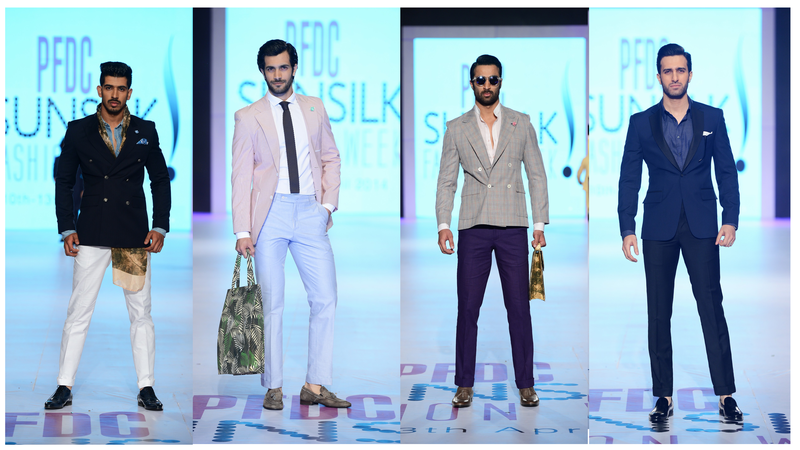 The PFDC Sunsilk Fashion Week has always featured menswear in supporting capacity but this year it finally came into its own. 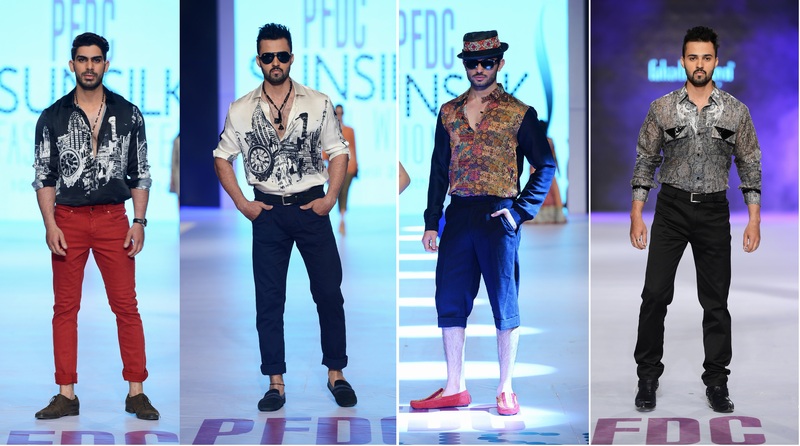 From surprise debutant Sania Maskatiya to returning powerhouse Republic by Omar Farooq, let’s take a look at what went down in the menswear category of the PFDC Sunsilk Fashion Week. For a designer who has conquered the womenswear market with her peculiar prints, modern construction, business acumen and booming retail business, Sania Maskatiya’s foray into menswear comes as quite a surprise. “We’ve had a huge demand from friends and family for men’s wear! Men are now more experimental and looking for funkier statement pieces,” exclaims the designer, who showed a capsule collection of six looks comprising of trendy jackets, waistcoats and funky shirts alongside her womenswear collection. Sania’s expertise lies in mixing most unconventional prints and making them look cohesive but it was quite smart of her to not overwhelm the menswear with prints. Smartly cut blazers and coats with just a dash of signature Sania Maskatiya print in form of inner lining, a collar or an uplifting pocket square were paired with trousers with contrasting piping running down the side. It was an extension of her womenswear aesthetic, toned down to suit the menswear aesthetic but still fashionable enough to stand out and be identifiable with the brand. The downside is her menswear will only be available by order for the time being. designers who has retained his strong signature and stuck to do what he knows best – returned to runway after a hiatus of two years. A lot has happened since then. Republic revamped its Lahore store and opened up a new one in Islamabad and it recently signed television heartthrob and the very dapper Fawad Khan as a brand ambassador, a partnership which can prove very yielding for Republic by Omar Farooq considering the kind of pull and mass appeal Fawad Khan holds. Republic’s collection was a simple lesson in summer suiting. Well cut blazers, properly hemmed pants and a summer colour palette; the collection was a guide to basic wardrobe staples, ones that men get wrong the most often. The collection demonstrated that a whole range of options exist (specially for summer) beyond the blacks and the browns that Pakistani men tend to stick to. It had plenty to offer in terms of style: pastel hues, window pane and check patterns for the blazers and pants with an injection of some spirit via use of botanical prints in scarves, pocket squares and shoes. Contrasting lighter colours with darker hues was a theme that ran throughout the collection, which one hopes will be a lesson for all men who believe in matching every piece on their body to a tee. While Arsalan Iqbal’s collection was a vast improvement on his previous showings, it was still not good enough to warrant the same praise as the other menswear showcases did. His androgynous collection was likeable in bits. 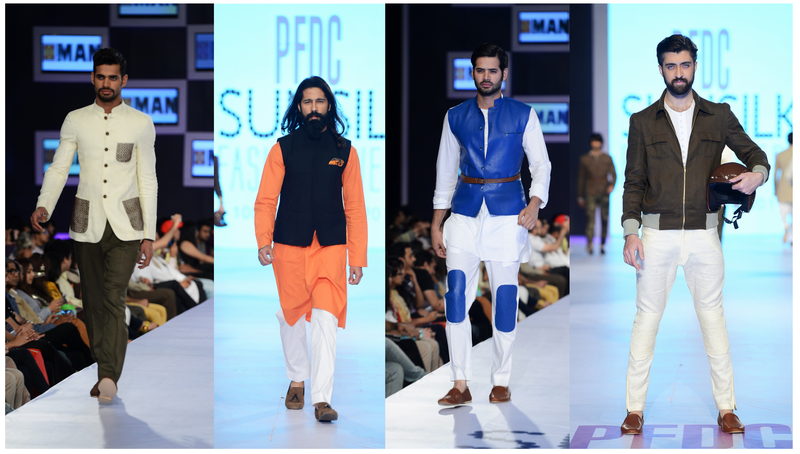 A dhoti shalwar had no place on the runway while rest of the pieces were overly done with the use of cutouts and tired out paneling techniques. But it did offer ample footwear options. The variety of colours and the immaculate finish of his Peshawari chappals reminded us why the local craft has nothing to fear from Paul Smith and his Robert sandals. 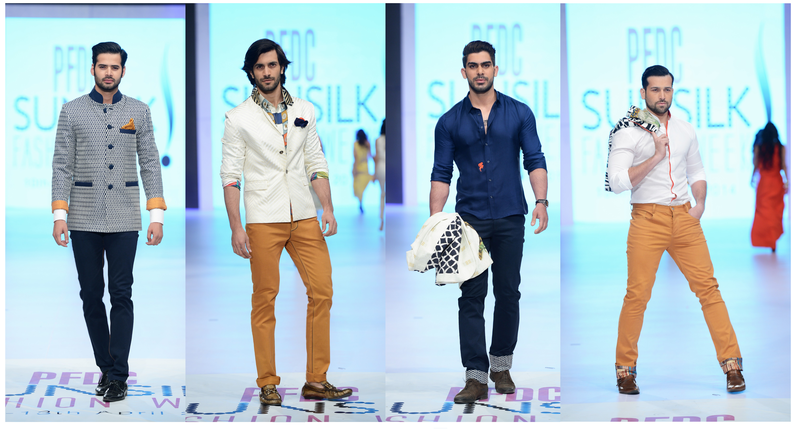 Bareeze Man was the surprise menswear package of PFDC Sunsilk Fashion Week. Double breasted jackets, pants with quilted knee patches, printed sleeve details, immaculately cut Nehru coats: these are the kind of menswear pieces one only gets to witness on the runways of Milan and London. There is quite a dearth of trendy high street menswear brands in Pakistan but Bareeze Man brought some style back. At the end of the day, it’s a brand like Bareeze Man brand that has the power to impact the way men dress because it supplies to the masses. It has retail presence in all major cities and going by this collection, it has a very strong command on design and the essence of modern dressing. We can only wait for this collection to make it to Bareeze stores because while the creative minds behind the brand assure us that the collection will be stocked soon, our past experience gives us all the reasons to be cynical.